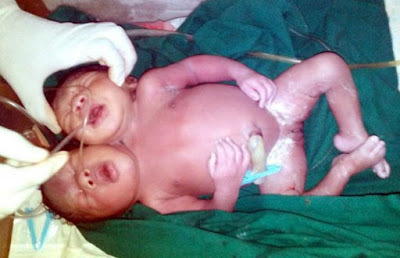 There was confusion in Ogudu area of Lagos State capital after a woman delivered a baby girl with two heads. The baby has two heads with oxygen tube strapped on each. She equally has a neck, chest, two legs and two hands. Doctors at Med-In Specialist Hospital, Osogbo Street, who took the delivery, said the baby was born around 6:30pm on Tuesday through an elective caesarean section. In medical parlance, the condition is known as Parapagus. It is a rare form of partial twinning where there are two heads and two necks side by side on one torso. Med-In Hospital Manager Dare Moses said the baby was taken to LUTH so that tests can be conducted to ascertain if they share also vital organs like hearts and lungs. He said: “There is need to find out if they share major organs together. They may have to be flown abroad for separation if they have separate hearts and other vital organs. It is possible for them to survive. I have seen cases of twins like this in movie surviving and living normal lives. “Normally, when we have cases of pregnant woman expecting twins, we usually go for elective caesarean, which was what the mother opted for. “But when the doctor was trying to extract one of the babies (first one), it got stuck and when he examined further, he discovered that there were two heads in one body. We are happy that the baby was delivered alive and placed on oxygen. Both heads were alive. She said: “Nobody can specifically say the reason for the condition. At different stages during pregnancies. Twins divide but these ones didn’t divide fully. We can’t really say if they have only two pairs of legs and hands, there’s a possibility the other pairs are inside. But we don’t know yet. “There are so many things we can’t really determine physically. That’s why several scans would be conducted, including CT Scans, to know their exact condition and the best option. “It is a situation that would be best managed abroad because it requires the putting together of a team of paediatric surgeons who must have the best facilities, which we do not have presently on Nigeria. “We have good doctors but the materials are not there. Specialists in different fields would be working on them at the same time if they are to be separated. Chances of their survival in Nigeria are very poor giving the realities of our society. “If they can’t be separated and are left to survive, people might ridicule them or see them as curses, which isn’t good. But in other climes, some conjoined twins have survived to adulthood and they are doing fine. “You should also know that it would be very expensive to foot the bills, and it isn’t what any parent can handle alone. The government and good spirited individuals would have to assist them so that the kids stay alive. All we want is to give them as much chances as they can possibly get to survive.